Are you cooking Thanksgiving dinner this year? 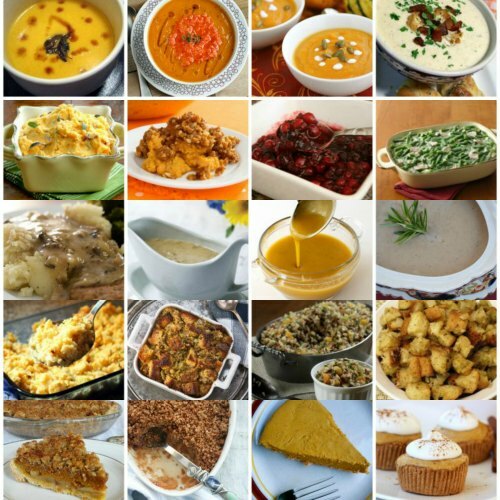 Why not try one of these 50+ Gluten Free Recipes for Thanksgiving! Going gluten-free can mean giving up on some of your favorite dishes, but do not despair! Even Thanksgiving recipes, in all their wheat-y goodness, can be made both gluten-free and delicious. Gluten lurks in a host of pre-packaged ingredients often used on Thanksgiving like gravy mix, stuffing seasoning and cranberry sauce. Omitting these pre-packaged ingredients will be necessary, but this can make the Thanksgiving cooking much more difficult. Thanks for the sharing some of my recipes – this is a great roundup!! What a wonderful round up of ideas!! I know plenty of people who are gluten free and always on the look out for recipes, this is the perfect post for them! Hoping you have a blessed weekend!! Thanks, Nicole! I put it together because my sister in law had to go gluten-free… but I didn’t want her to miss out on some of her favorites 🙂 Happy eating! Nice, I need this for my sister in law is gluten free. Pinned & shared. Thanks for joining the Inspiration Spotlight party.